Are you ready for a real adventure? Let's go to Komodo island to see a real Dragon, no t in the movie. Komodo island is beautiful. Seeing is believing. If you have plenty of time in your holiday to Bali, don’t forget to Komodo National Park. 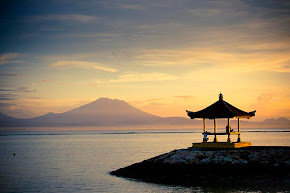 While most visitors enter Komodo National Park (KNP) through the gateway cities of Labuan Bajo in the west of Flores or Bima in eastern Sumbawa, the departure point for your trip is actually Denpasar, Bali. Komodo National Park includes three major islands: Komodo, Rinca and Padar, as well as numerous smaller islands creating a total surface area (marine and land) of 1817km (proposed extensions would bring the total surface area up to 2,321km2). As well as being home to the Komodo dragon, the Park provides refuge for many other notable terrestrial species such as the orange-footed scrub fowl, an endemic rat, and the Timor deer. Moreover, the Park includes one of the richest marine environments including coral reefs, mangroves, sea grass beds, sea mounts, and semi-enclosed bays. These habitats harbor more than 1,000 species of fish, some 260 species of reef-building coral, and 70 species of sponges. Dugong, sharks, manta rays, at least 14 species of whales, dolphins, and sea turtles also make Komodo National Park their home.